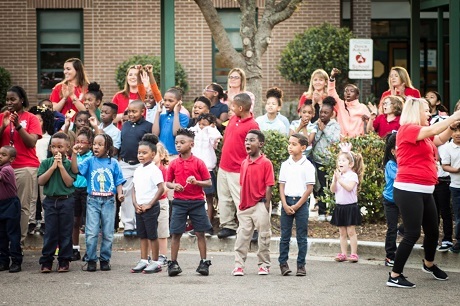 EYE: First, tell us what adversity kids in your schools face in Charleston? KATIE: Many are trapped in unpredictable home lives. I see it firsthand. Some come from wonderful families, but unfortunately for some others behavior is an issue, usually due to a horrible home life. In tough cases, kids wear the same clothes every single day. Sometimes they smell like urine; they are filthy. Kids have no shoelaces, have holes in the bottom of shoes, can see their toes and some never knew what socks felt like. At five years old, some walk home for thirty minutes uphill to an unlocked house, get themselves a bowl of dried cereal and watch television until their mom gets home. EYE: Did you ever feel like getting personally involved in their lives? KATIE: Other teachers and I would take home clothes like winter coats from kids and wash them. Some had coats that were five sizes too big for them, and that would be their coat for all their elementary years, keeping it even when it became too small. I once had a girl tell me she had no idea what it was like to sleep on a pillow, so I went out and bought her two pillows. Kids can’t get their homework done because they are caring for the younger kids in the house. Or, kids don’t sleep at night because they are stressed about what might happen to them when they are sleeping. It’s just horrible that these kids face things like that every day. EYE: Most of us look for tangible ways to improve lives with shelter, clothing, food, etc. You found that the intangible of experiencing joy was equally important. Why did you choose bikes to implement that? KATIE: There are so many wonderful nonprofits out there that focus on the needs you mentioned. But I think we forget any one of us, poor or not, can have all the basic needs, but take out anything in your life that brings you joy, then what kind of life are you left living? A child doesn’t choose their walk of life, parents or situations. Yet, if there is a little bit of joy, I believe it can change the outcome of a person’s life. 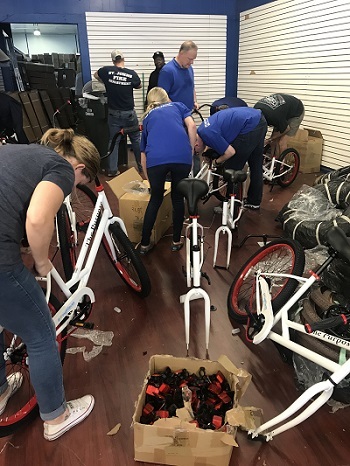 If a child realizes that the community did something for them and brought them joy after getting a bike, she or he may treat that neighborhood differently in return. EYE: What is it that bikes represent? KATIE: As a society we take for granted these accumulative memories that we have of joy, those childhood memories of joy. We all rode bicycles. We dressed up at Halloween, or swam in a pool. Those are all basic childhood joys. These are not video games or hoverboards and extra cool things. Those are just basic joys, basic childhood experiences. I don’t feel okay that kids are missing out on that. It’s also about ownership, something to feel pride about. Many of these kids don’t even have a bed to call their own. They have nothing that is really theirs. This is something that is custom made at the local bike shop, high quality and extra special….and it’s all theirs. EYE: What triggered your idea to start Going Places? KATIE: I was a teacher for several years. I used to take one little boy out weekends and after school because he wasn’t doing anything; he wasn’t going anywhere and was very unmotivated. He lived with his grandma. I realized that no one had ever given him a reason to be motivated. So I wanted to show him all the cool stuff out there you can do after you graduate from school. But, you have to get through school first. For his birthday he said he wanted was a bike. Since I could not afford to get him a bike, I thought about Go Fund Me so someone would give me that money. But then I thought I should do more. EYE: Wow, that sounds like a huge project to take on. KATIE: Well, other kids in the class have rough home lives and could use the escape of a bike as well. And then I thought, what about the next grade and the next grade, etc? Ninety percent of the kids in my school live at or below the poverty line. Even the kids that are in the 10% are not swimming in wealth in a school zoned as Title 1. They could all use a new high quality bike that grows with them for many years. 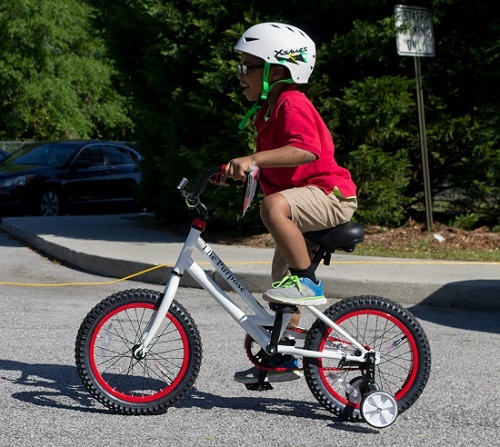 The cost of bike, helmet and lock is less than $110 each; the investment in a child’s future is priceless. 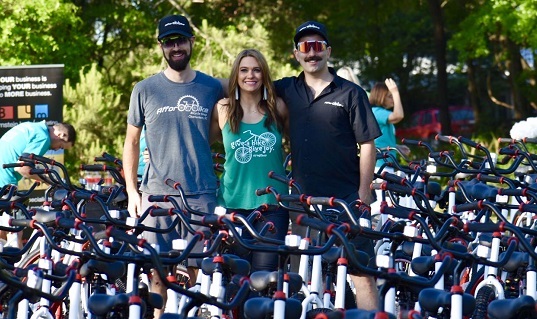 I decided to raise enough money for everyone to have a bike. EYE: What was the first step you took to get this idea rolling? KATIE: I was sitting in my pajamas watching Friends on TV on the couch the day after Labor Day. I just made the Go Fund Me and I started sharing it. It was that simple. And, it went viral. EYE: What was the biggest challenge to setting up the Foundation? KATIE: I am someone who is ambitious in the sense that I just want to do it. However, I knew nothing about nonprofits. I don’t have a business background. For me, it was all about the internal organization and finding an amazing board of experienced professionals, which I have now, who were excited about my vision and whose input I trust. EYE: What is the significance of the name Going Places? KATIE: Originally, the Go Fund Me campaign took on the slogan Let’s Go Places. Then I realized that was Toyota’s motto. I just hoped they wouldn’t sue me. For me, Let’s Go Places actually came from Dr. Seuss’ All the Place You’ll Go. I brainstormed a shorter version with a friend and we came up with Going Places. It’s a spinoff of Dr. Seuss, which ties it to education. I think with a little bit of joy, you can really go places! EYE: Are the kids responsible to do anything in return for the bikes? KATIE: No. It is probably one of the only criticism I’ve gotten. These bikes represent so much to these kids: the freedom, escape, ownership, joy and childhood innocence. It’s so much more than just a treat. Additionally, our whole hashtag is #spreadjoy. I hope it instills in them to spread joy to others and to treat people kindly, to do something nice for them when they understand someone has done something nice for them. That’s it. 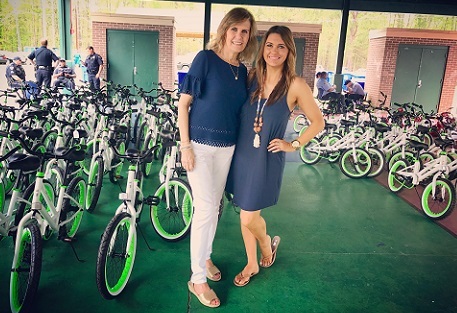 I’ve already heard kids say they already had a nice bike, and they donated it to someone who doesn’t have one. They are already spreading the joy because they know how that bike made them feel. EYE: So you are seeing other signs of success? KATIE: In the Pepperhill neighborhood kids ride their bikes so much that the community said last summer was unlike any summer they’d seen before. That’s the first time ever they saw kids being kids. There are whole hoards of these kids riding their bikes and playing in the streets all summer in the neighborhoods together. They loved watching them be kids. It warms my heart so much. EYE: Is it key for the community to participate? KATIE: Yes. We are all about locals supporting locals. That’s why we support local bike shops who in turn are supporting the community. In our outreach, we look for what Affordabike does for us. It’s all about supporting each other. EYE: Was it a risk for you to leave your steady teaching job to pursue Going Places? KATIE: I am a risk taker. I’ve lived in four states, had three careers and am 35. I moved from Chicago to Charleston on a whim. I moved here knowing nobody and without a job. I found my roommate on Craigslist. I just did it. My theory is, why not try? I’m not afraid of failure. I felt I was changing lives at recess and not at the reading table. When kids chose not to play and wanted to hang out with me, that’s when I felt like a real person. I really got to know them. EYE: What occurred to you as you engaged with different kids outside the classroom? KATIE: It dawned on me that I am probably one of the only adults in their lives who has a conversation with them and laughs with them. I realized I was changing lives by taking kids out after school or weekends, all that extra stuff. For me, the academic wasn’t changing lives. That’s when I thought I could be out changing lives another way. This happened the way it was supposed to. EYE: Is there anyone who has inspired you? KATIE: My mom did full time charity work with the Assistance League of Southern California’s Operation School Bell. Kids from low-income schools would come by bus and get hygiene kits, clothes and toys. I used to help with that. However, there was a distinct turning point for me. Like many parents, mine would say, “Clean out your closet and give it to kids who don’t have anything.” I did that. I put the stuff in a big garbage bag and that was the last time I saw it. Well, I once went to see where the things I was donating were going. I watched a little girl pick out what I had donated. To see her excitement, her joy, that really stuck with me. You don’t often get to see it full circle like that. So, I guess it all started out with my mom inspiring me. EYE: What is your favorite memory on your bike? KATIE: I remember going on my bike to the pool to the bike all summer. I remember pedaling as fast as I could. I remember thinking there wasn’t a person who could peddle faster. The wind was in my face and I felt so independent. There was confidence. I felt like I was running the world in that moment. Nothing felt better than that. It does something to you internally. I’m 35 and I remember this from when I was eight. EYE: Katie is certainly going places and TWE wishes her continued success. She has begun to expand. 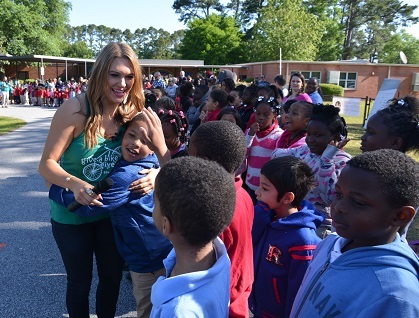 In addition to growing her program to Raleigh, North Carolina, she is launching a Halloween costume program as well as “Give a Surprise, Give Joy to Teachers and Staff.” Thank you, Katie, for your time!